The Pilot sport 2, much like the Michelin super sport is designed for high performance cars, and holds claim to the world track speed record of 250mph when fitted to a Bugatti Veyron. The Pilot Sport 2 is taking over the reigns from the original benchmark in this class set by it's predeccesor the Michelin Sport. 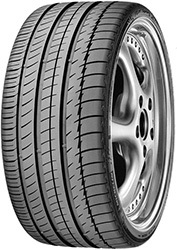 A Low profile High Perfomance tyre. The DT1, indicates that this is the latest edition of the Michelin Pilot Sport 2's tread pattern.